Q&A with #RETAS Sponsor and RealMassive’s CEO, Craig Hancock. We are a true marketplace, connecting supply and demand for commercial real estate assets, firms, and professionals. Atop an intuitive (and free) list and search platform, we have built modern digital and social marketing capabilities and performance analytics for our paying subscribers. RealMassive’s marketplace removes the barriers above by delivering open digital access, modern marketing exposure, and real-time insights to help professionals save time and accelerate deals. Our new professional profile pages, firm pages, and demand-side search experiences are exciting additions to the marketplace as they showcase our capability in adding value to industry data. We enable users to consume information in a variety of ways beyond traditional search, with the ability to dive deeper, connect, save, and share this information. We have invested significant resources measuring site usage and search patterns, contributing to the design and launch of a new set of analytics tools. Our initial analytics dashboard will provide pros with real-time visibility into reach, source traffic, and market-level metrics, and also allow us to quickly iterate and launch proactive alerts, competitive benchmarks, and behavioral insights. It is already a large and growing sector, which can sometimes cause confusion and friction in an industry historically slow with tech-adoption. However, we find the #CREcosystem to be incredibly collegial and collaborative, and we look forward to exploring synergies where they make sense for our customers. We’ve already built and installed a new, modern commercial real estate marketplace. Now it’s a matter of optimizing experiences for all participants, independent of geography, device, or role in the industry. 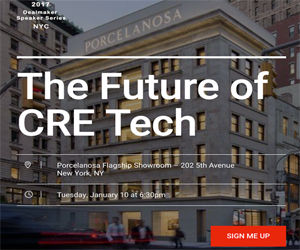 We will ultimately connect every person and place in the global CRE marketplace, which will keep us busy exploring new markets and building relationships with industry professionals and tech partners. Connect with RealMassive on Facebook, Twitter and LinkedIn.